Quilting and Reflection — Hi! I'm Kat Sturges...Loving the Creative Life! As I sat at the sewing machine quilting this work today, I kept thinking about what a long strange trip it’s been! Lately I just feel on top of the world! Everything just feels right lately, sure there are small bumps in the road but I’m checking the quilts off my life list and that feels pretty damn fabulous! I am a simple woman with simple dreams. Back when I first created a collection of quilt tops I felt like an imposter. I couldn’t for the life of me figure out how to quilt the pieces. I attempted one of them and totally bombed the quilting process which ruined the entire quilt! So I let a year or two go by without completing many quilts. I made some for family here and there but had all but abandoned my hopes of selling any of the blankets. What a difference some time and practice can make! 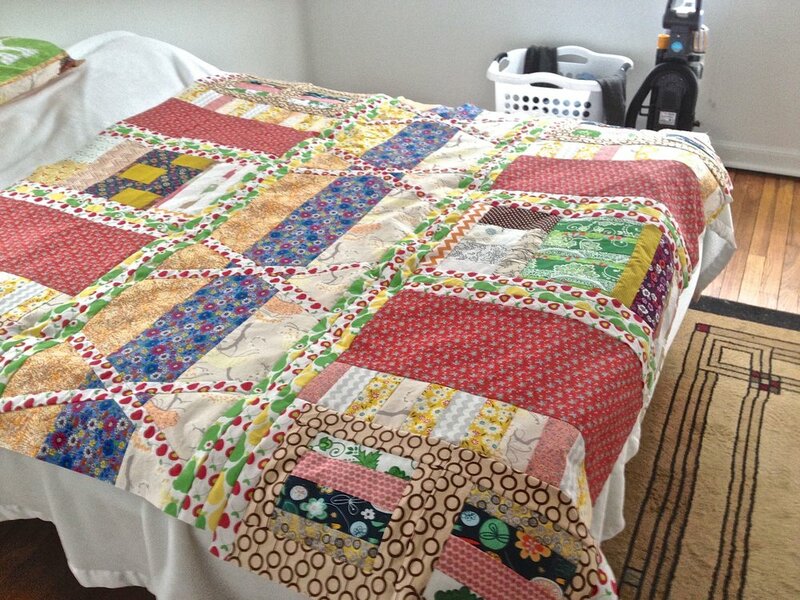 I made a quilt for my sister but did the finishing process differently. Instead of quilting through three layers at one time I sewed the quilt top to the backing first and then added the back fabric as a last step. She told me that the quilt is holding up great to wash and usage, and encouraged me to finish the rest of the quilts in the same way. So the above quilt is now the fourth that I have finished since Christmas. I made one for my Dad, then completed two more which I sold on EBay. The English Garden Quilt holds a very special place in my heart, when it was on Etsy it got nearly 300 hearts and I developed a crush on this blanket. It reminds me of an English garden…the way that those gardens are so decorative and carefully planned. When I was in Europe back in my youth I was struck by the beautiful gardens in town squares, where you could tell that so much love went into the planting and care of the beautiful blossoms. I’ve decided to keep this quilt for myself! After this there are three more waiting to be finished. One of them is a retro kids quilt, I made it too big the first time around so I will be breaking it down into two or three smaller pieces. Then there is the quilt I’m calling Canary Yellow, a totally stepped out improv throw with a ton of character. The last is a king sized blanket that will be a challenge to quilt up, but so worth it. I have some new blankets planned and in the works. And I no longer feel like an imposter at quilting, but have stepped fully into the role with sweet success!